Perry’s Jamal Whiteside drives to the basket against Cory-Rawson’s Tommy Stauffer, left, and Brandon Zuercher during Wednesday’s game at Cory-Rawson High School. Perry’s Ryan Yingst shoots over Cory-Rawson’s Carson Houck, left, and Tommy Stauffer during Wednesday’s game at Cory-Rawson High School. RAWSON – Perry flipped out its press when it needed it the most. 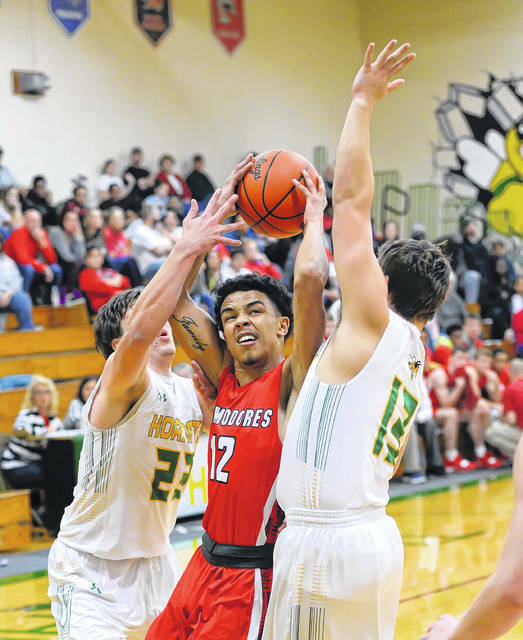 The Commodores’ press caused havoc down the stretch and it helped Perry post a 58-51 victory over Cory-Rawson in a boys basketball game Wednesday at Cory-Rawson. Perry had taken its press off in the second half, but with 4:30 to go, the Commodores trailed 46-45. Enter the press one more time. Cory-Rawson turned the ball over five times in the final 4:30 and 28 times for the game. That helped Perry rip off a 9-0 spurt to pull out to a 58-49 lead with 21 seconds to play. Perry freshman Terry Riley gave the Commodores the lead to stay 50-49 with 2:49 to go. Perry is 1-1. It was the opening game for the Fighting Hornets. Chazz Jackson led Perry with 17 points. Jamal Whiteside added 13 points. Perry freshman Ryan Yingst had 13 points, including hitting two free throws to push the Perry lead to 52-49 with 2:13 to go. Martell White had one point and eight rebounds. Cory-Rawson stayed closed until the end by hitting 8 of 17 on 3-pointers. Tommy Stauffer had 15 points and nine rebounds for the Fighting Hornets. Logan Stuckey had 10 points, Brandon Zuercher had nine points and Kyle Schultz scored eight. Stuckey, Schultz and Zuercher all nailed two 3-pointers. Perry won the boards, 26-19. “They were able to play their wide-open style more than we were able to play our style,” Birchmeier said. Perry led 23-15 after the first quarter and 37-25 at the half. By halftime, the Perry press had forced 16 Cory-Rawson turnovers. Perry has a nice mix of veterans, but also has four freshmen logging minutes in the rotation. “We have a weird mix of kids right now, with seniors and freshmen and we have to find the right combinations,” Tabler said. Perry came out with a variety of presses and ran out to a 9-2 lead after turning the Fighting Hornets over six quick times. Cory-Rawson recovered from the all-out press and got within 15-13. Perry went on a 6-0 run to close the first quarter with a 23-15 lead. 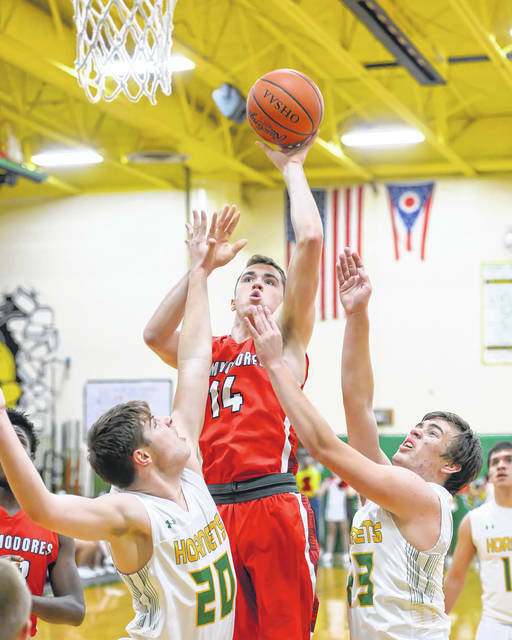 Cory-Rawson’s offense found open shots once it broke the Perry press and the Hornets were within 27-23 midway in the second quarter. Perry then ripped off a 9-0 run to pull out to a 36-23 lead. During that run, Perry freshman Will Knight had four points and Whiteside sank a 3-pointer. Jackson had 13 points by halftime, including 11 in the first quarter. The Fighting Hornets went on an 11-1 run to start the third quarter to get within 38-36. On that run, Stauffer and Carson Houck both sank 3-pointers out of the corner. https://www.limaohio.com/wp-content/uploads/sites/54/2018/12/web1_Perry-vs-CR-RP004.jpgPerry’s Jamal Whiteside drives to the basket against Cory-Rawson’s Tommy Stauffer, left, and Brandon Zuercher during Wednesday’s game at Cory-Rawson High School. https://www.limaohio.com/wp-content/uploads/sites/54/2018/12/web1_Perry-vs-CR-RP001.jpgPerry’s Ryan Yingst shoots over Cory-Rawson’s Carson Houck, left, and Tommy Stauffer during Wednesday’s game at Cory-Rawson High School.